The two suspects in the case have been identified as Timothy Young and Brittani Hill. They are currently in the Montgomery County Jail in Ohio, awaiting extradition back to Michigan where they will face charges. "That just doesn't seem plausible that something would happen here. It's just things you hear about, but you don't think happen in your neighborhood," one neighbor said. Tophith Road was filled with the Jackson County Sheriff's Office and State Police Crime Lab Saturday as the team worked to uncover the body of an infant, buried in a shallow grave in the backyard of a home. The search was prompted by a tip from the Dayton Police Department in Ohio. "They received information from an anonymous source, presumably somebody close to these parents," explained Jackson County Undersheriff Chris Kuhl. "That they felt something had been done to the child or perhaps these people knew the parents and knew they had a child before and now they did not." 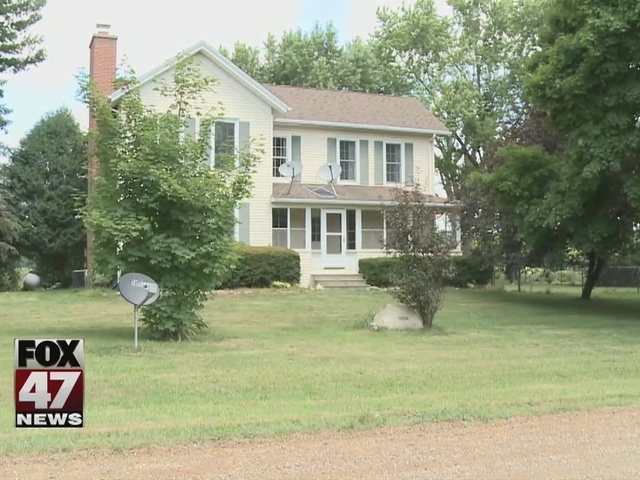 The Undersheriff said the parents had rented the home on Tophith Road until late 2015, early 2016. "I know that they have been very transient over their life and have lived in numerous locations and again, the most I know is they've been down in Dayton, Ohio for the last several months," he added. Another neighbor told News Ten that when the couple moved in, he got an eerie felling about them, like they didn't belong or didn't fit in in the neighborhood. Police believe the body was that of a baby boy who died somewhere between the age of 6 months to a year. "We suspect that it's been there for probably within the last 5 to 7 months. So, we're talking probably very late winter, very early spring," Undersheriff Kuhl added. The Medical Examiner and anthropologists with MSU are trying to determine the cause of death. "Based on the conditions of the remains, I'm not sure that we will ever actually be able to definitively determine how the child died," the Undersheriff said. "Minimally, we know that obviously, the child was buried in the shallow grave and we allege was put there by them." "It's just a very sad circumstance that somebody would think burying a baby in the backyard would be the solution to a problem," one neighbor added. The man and woman are behind bars in Ohio, waiting to be extradited to Michigan. They're facing two charges in Jackson County, including concealing the death of an individual and removing a body without a medical examiner's approval. We'll let you know when they're back in Michigan and face a judge. UPDATE - Jackson County Undersheriff Christopher Kuhl tells us that the child was most likely between six months to one year old. He said it appears that the child had been buried for about 5-7 months. The Sheriff's Office says that they were contacted by detectives from the Dayton Police Department in Ohio on July 22, 2016 around 9 pm about the possibility of a child's death that had occurred somewhere in Jackson County. Officers in Dayton had contact with the parents of the child, who provided information about the location of the body.